"When ever a paradigm shift takes place there is the opportunity to create value. Conversely value can also be lost during a paradigm shift. What become significant in understanding paradigm movement is velocity, direction and value displacement." The phrase is used to describe any sort of major shift of mind-set or world - view. According to Kuhn an approach to analyze periods between scientific revolutions. To venture forward. A new business with the potential for high growth that entails risk. 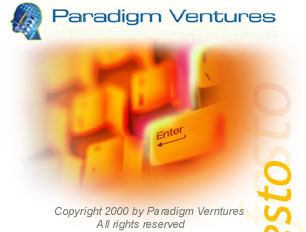 Paradigm Ventures was founded to challenge traditional approaches for analyzing, investing and developing technology focused ventures. In the last decade there has been a nearly unrecognizable change in the technology and financing landscape. Nevertheless, there are still a number of challenges. A number of firms still have investment committees located in distant places. A straightforward transaction can sometimes take between 6 months and a year to close. This time scale must be viewed in the context that significant developments in high technology market segments are often changing every 100 days. When ever a paradigm shift takes place there is the opportunity to create value. Conversely value can also be lost during a paradigm shift. What become significant in understanding paradigm movement is velocity, direction and value displacement. One of the major drivers in technology is regulation. Legislators and the courts can control, if they choose, with precision, paradigm shifts. The strategy of Paradigm Ventures is to target ventures that have exceptional growth potential and the ability to move to the next logical step of an enterprise's maturity level. Paradigm Ventures is an activist partner, helping to identify and to put in place those value drivers that are necessary for a company to grow and prosper.